An ideal pick for the adventure seeking souls traveling across the globe, Bhagirathi Peak Climbing Expedition gives enough adrenaline rush to recall in later years. One of the most exclusive peaks in Garhwal Himalaya near Gangotri Glacier in Uttarakhand, Bhagirathi III reaches a height of 6454m on summits and claimed to be the 3rd highest among the Bhagirathi Group of Peaks. It is close to the other stalwart peaks of Thalay Sagar, Shivling and Meru. Technically difficult without being extreme this peak is dotted with beautiful rocks and surrounded form all sides by gigantic granite walls. Enchanting scenic views exhibited by the lofty snow-clad mountains instigates one to reach at summits without much wait. There are several flat spots with pleasant weather where climbers & trekkers would love pitching tents without any second thought. The fun of this expedition starts when you will camp at Bhojbasa. The route approaching upwards from Bhojbasa brings 1000m of vertical granite grounds, 200 m of rugged terrains with mixed rock and steep ice. Base Camp of Nandanvan is a beautiful meadow speckled with the alpine flowers. On arrival at Delhi airport, you will be received by our travel executive. Check-in to the pre-booked hotel. Dinner and overnight stay in hotel. After breakfast drive to Indian Mountaineering Foundation for a short briefing about the peak. Also meet the Liaison Officer. Overnight stay in hotel in Delhi. In the morning drive to Rishikesh. Once you reach, check-in to hotel. In the evening go visiting Ganga Aarti, the most vibrant daily ritual ever in Rishikesh. Overnight in hotel. While driving to Uttarkashi from Rishikesh, you will be rewarded with mesmeric views of Narendra Nagar Town (15km from Rishikesh). Dharasu is another beautiful town on the way to Uttarkashi. On arrival check in to the guest house booked for you. Overnight in guest house. Today, we will be driving to Gangotri. Gaumukh, where the glacier feeding Ganga is found is around 19km from Gangotri. Overnight stay in tourist bungalow or in camp. Early morning after breakfast visit the temple of Gangotri and then trek to Bhojbasa. Today’s complete trek proceeds along the lively river Bhagirathi. Once you reach set you camp here. Afternoon you are free to explore the scenic locale and witness the superb views of the sunset on Bhagirathi Group of Peaks. Overnight at camp. Once you reach Nandanvan, you will fall in love with this region for its awe-inspiring meadows. Lush greenery with alpine flowers spread its charismatic aura over this region. 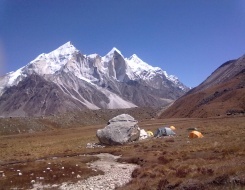 From your campsite you can witness a glimpse of Shivling and Bhagirathi mountains. You need to walk for two hours to come across alpine meadows and sandy flats. Reaching there we will be setting the base camp for further acclimatization. The Low Altitude Porters (LAP) will go back from this place. Only cook and kitchen helpers will stay back with you. As per the plan made, our High Altitude Porters (HAP) will accompany you. The days are for climbing up when camps will be set in different levels with the help of our High Altitude Porters. On day 23 and 24 you will get to reach the summit and you will be blessed with the unparalleled views of the mountain peaks of Bhagirathi. Camp/Spare (Our LAP will approach you this day to trek back). After breakfast trek down to Bhojbasa. Overnight stay in tent. In the morning after breakfast trek down to Gangotri and from here drive to Uttarkashi by car. Overnight stay at hotel. In the morning after breakfast drive to Rishikesh. Overnight stay at hotel. After breakfast drive to Delhi. Overnight stay at hotel. After breakfast visit to IMF for debriefing. Later back to hotel for relax or do own activity. By evening transfer to airport to catch a onwards flight.